Raw noise is the chief weapon of these mid-sized Heartless which lurk in treasure chests. Be sure to block their sound bullets. TIP: Illusion-based attacks like these bullets can flip-foot you, which reverses the directional controls for basic movement. The Cymbal Monkey is an Emblem Heartless that is found in Kingdom Hearts 358/2 Days. It likes to hide within false treasure chests, and pop out when they are opened. A Cymbal Monkey, true to its name, is a monkey-like creature with violet skin. It has small ears that are black on the inside, as well as two large, jagged horns on its head. Its face is pitch-black with glowing yellow eyes. It wears a high-collared, slightly tattered, black coat with white cuffs and thin, red lines decorating its collar. It holds two gold, diamond-shaped cymbals in its hands, and its Heartless emblem is printed on the front of its coat. The Cymbal Monkey's name references cymbal monkey toys, which it resembles. Once it pops out of the chest, immediately block its sound projectiles. Doing so will reflect them back at it and should defeat them in one shot. Failure to do so may give Roxas a high chance of being inflicted with the flip-foot status effect. 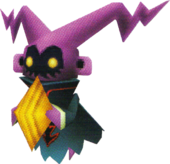 Other than that, this Heartless is not much of a challenge, so just attack it until it is eliminated. The treasure chests that they hide in are the only treasure chests seen in Mission Mode, thus making them easy to avoid. This page was last edited on 2 May 2018, at 15:03.